Google has been warning us for years of the impending doom. In the past they said they prefer responsive design. In case you aren’t familiar with responsive design, it basically means your website can adapt to any size screen, including tablets, phones, etc. Well now they have set a deadline of April 21st, 2015 and will then start penalizing sites that are not mobile friendly. 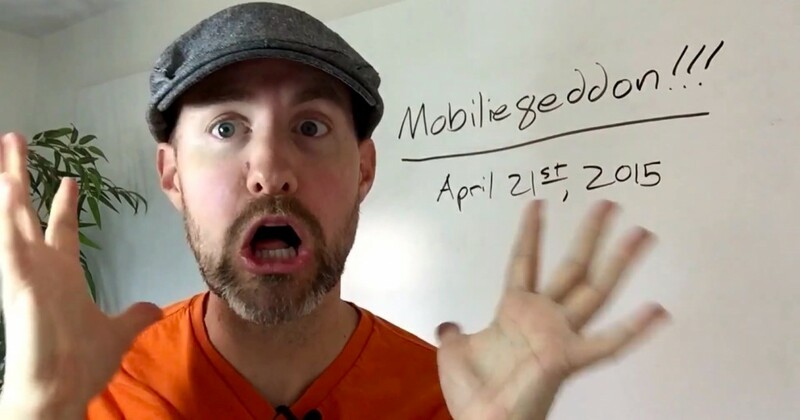 Now there is a lot of fear and hype being thrown around about “Mobilegeddon” as some are calling it (or Mobiliegeddon as I mis-wrote in the video!). Most likely this will affect searches on mobile devices in the greatest way, however that is nothing to scoff at. Over half of all internet traffic comes from mobile devices, so this can have a serious impact on your ability to get business and be found. Potential tenants tend to house-hunt on mobile devices. So they are an important group to please. Even more importantly people are searching more and more for local businesses through local search tools & map apps on mobile devices. What is responsive design? Responsive design is where the site can adapt to any size screen based on width. You see, back in the day when we built sites, we had to add mobile versions for every different device and would serve up a different version of the site based on what device the browser reported. This got pretty messy with all the smart phones and tablets. Then someone had a brilliant idea… why not just serve up the same site that can adapt and work on any size screen. Test our site out right now by grabbing the edge of the browser window and gradually shrink it narrower and narrower until it won’t shrink any more. Notice that a horizontal scroll bar never appears… that is what responsive design is. If you need a new website designed, or want a responsive website then reach out to us. We can work fast and will even help you write the content so you can keep focusing on managing your properties.